Sounds like there were all kinds of amazing things going on in the sanctuary today! Aboard the our vessel Sanctuary with Captain Earl we were thankfully no exception. 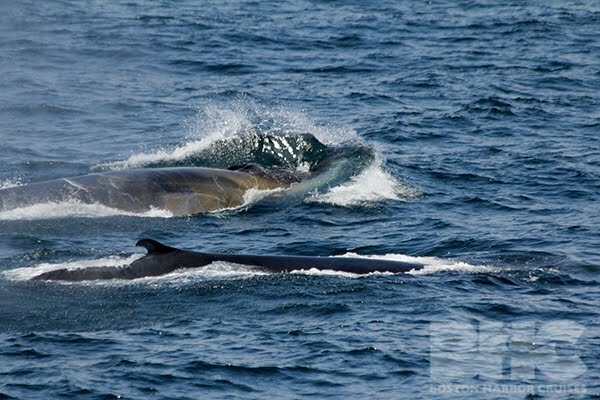 Our first trip took us to the southeast corner of the bank off of Cape Cod where we first got in some looks at a fin whale that was being a bit elusive, so we continued eastward based on the reports of a couple other boats in the area. 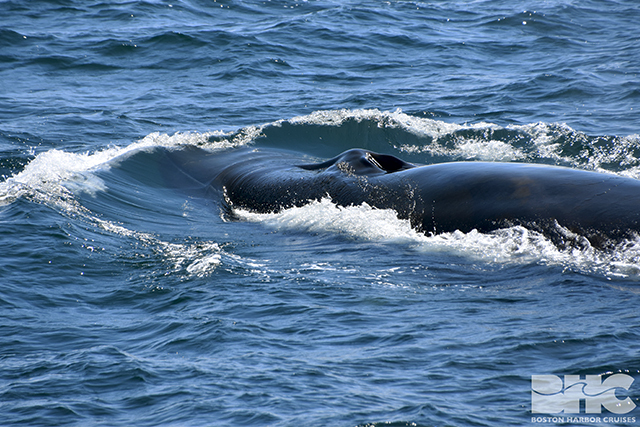 What was really wonderful to see (aside from our whales) was the huge amounts of BAIT in the water! We got an up close look at lots of sand lance all congregating at the surface at one point. Naturally there were also a ton of birds around, so all really encouraging signs that things are picking up again! Out east we found not one but TWO fin whales making some white water and enjoying the bounty of fish in the area. 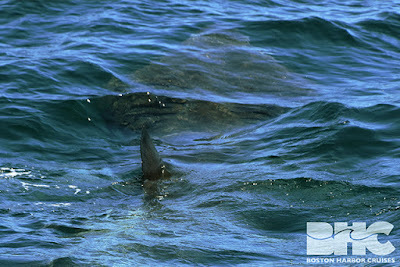 They did a couple of bouts of feeding, turning on their sides so we could see their flukes (see photo!) 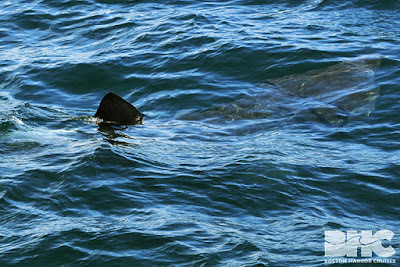 and generally charging very forcefully through the water. 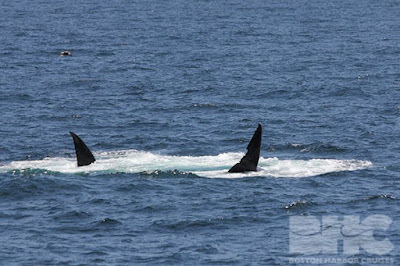 At one point we were right alongside both of these whales as they swam very purposefully toward another area teaming with fish, birds, and at least one other whale. 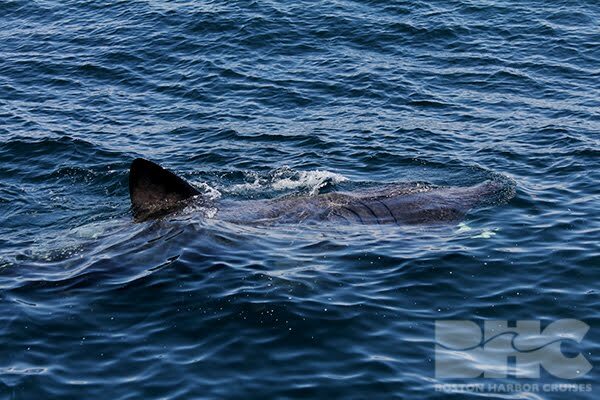 While we were waiting for them to come back from their dives, our intern Taylor spotted a dorsal fin in the water of what turned out to be a huge basking shark! This shark stayed up alongside us at the surface for about ten to fifteen minutes, at one point right alongside the boat so everyone could get some fantastic looks at this incredible animal. 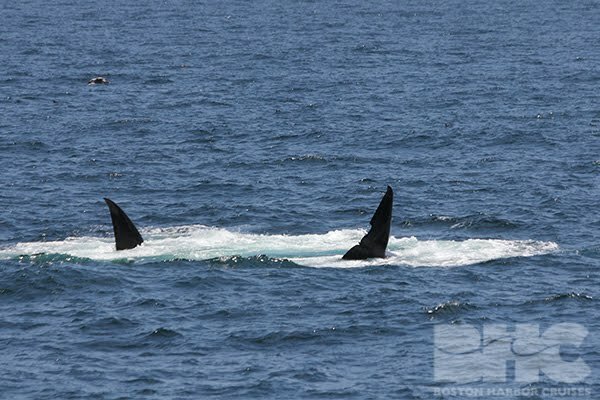 We also had the shark and both whales right off the bow together! For our second trip we headed toward mid bank hoping to pick up Shuffleboard as reported by the 12 PM trip. 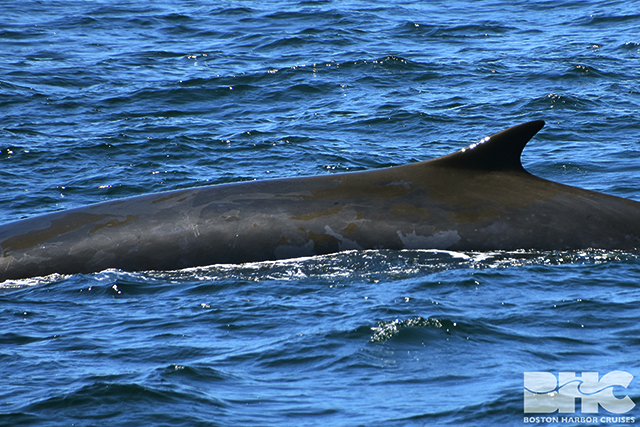 We stopped for a few minutes on another fin whale that was being very low profile in the water and even displaying what might have been logging or resting behavior. 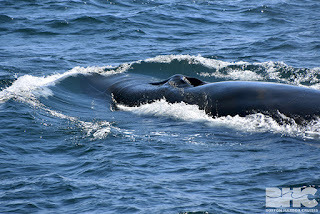 This whale also proved to be taking longer dives and coming up farther away, so we pressed on and were able to locate Shuffleboard, who helped us out by displaying some behavior that caused lots of whitewater (maybe a breach?). 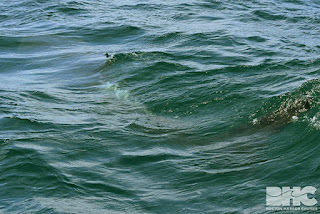 When we caught up with her she was doing some awesome bubble net feeding and we even got a couple glimpses of her open mouth, and she graciously showed us her fluke once when she went down for a dive. She also at one point breached to our right, perhaps because of the building seas. 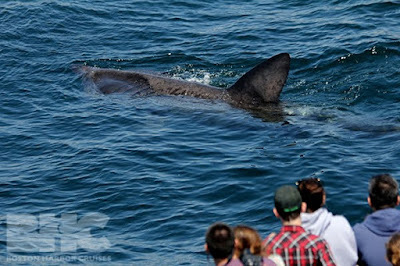 We were luckily able to get some great looks at her before the wind really picked up and the sea conditions deteriorated quickly. A big thanks to Captain Earl for getting us home safely, our crew for helping out, and our hardy passengers for sticking out those wishy-washy seas! 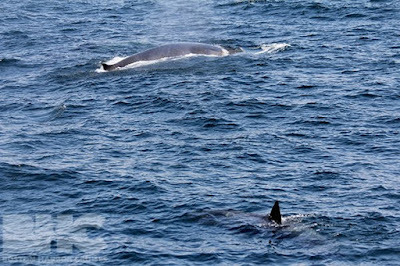 Today aboard the Cetacea was an unusual experience. Captain Jim and I agreed to start upon Midbank along an excursion that would eventually bring us just north of Provincetown. A large belch of bubbles ascended across our bow, causing us to halt and observe massive bait balls throughout the vicinity. 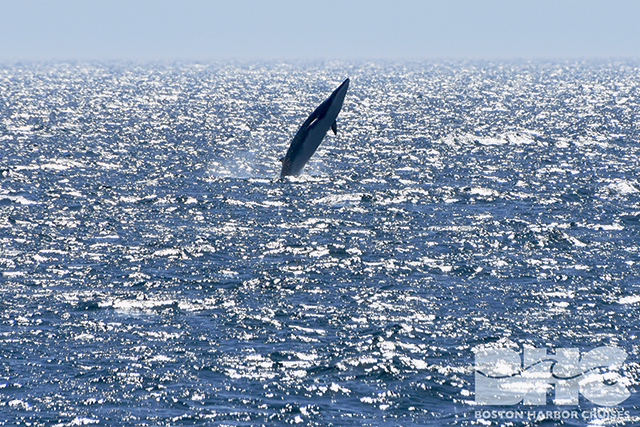 We cautiously accelerated and a minke suddenly breached at a distance of 500’! 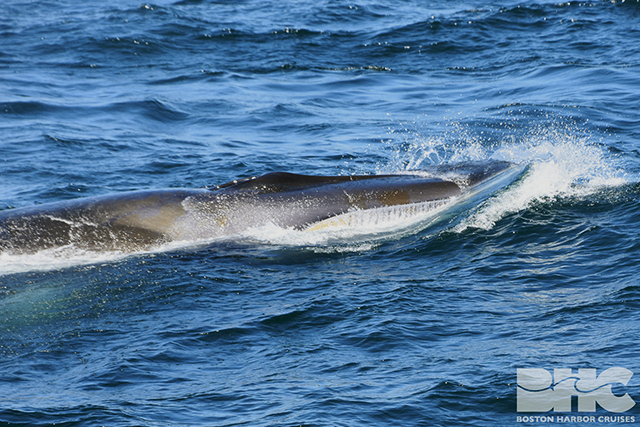 This individual breached four more times and then vanished in an instant, typical for this meek baleen species. 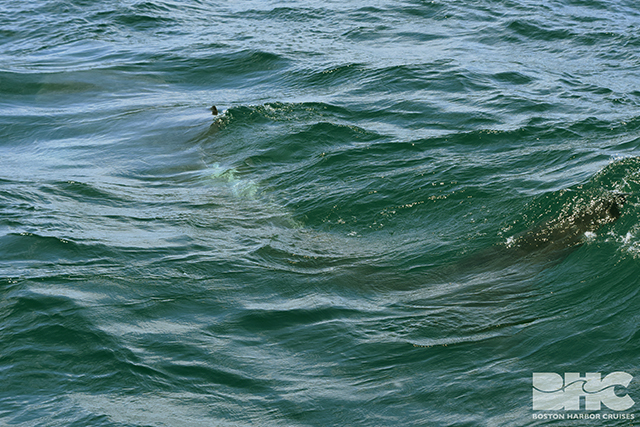 We continued on a lengthy eastern journey and covered the Southwest Corner without a blow in sight. 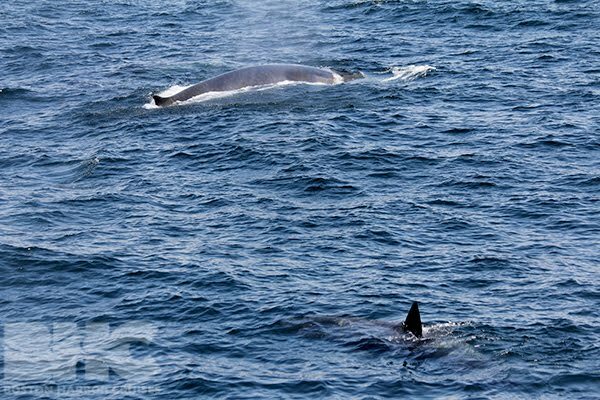 As we passed north of Provincetown three powerful blows were thrust skyward, and we were pleased to observe a fin whale informally dubbed 16BP18 as it plowed the surface with an unknown accomplice! The duo huddled in synchronicity while a third dove without any further sighting. 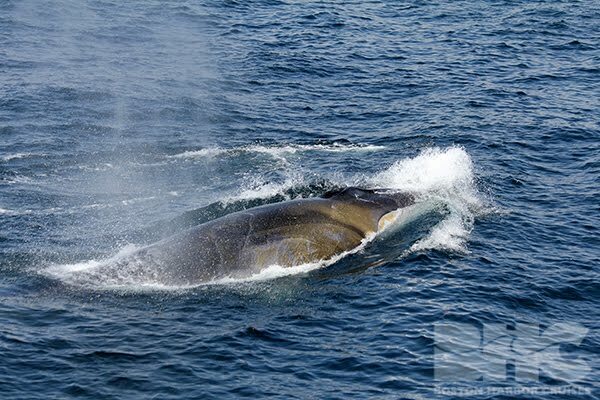 After mighty close looks our conglomerate headed west for a lengthy return home, and the waters were teaming with brown shoals of visible sandlance! 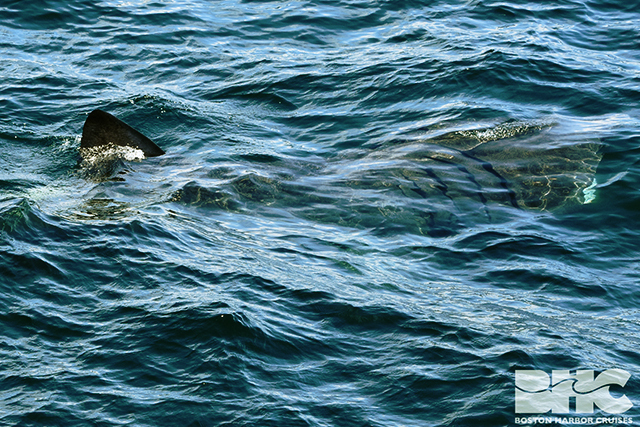 The air was primed with anticipation as this was a prime opportunity for any apex predator to feed. Our wheelhouse noticed two brown spades of cartilage pass through the surf, and found ourselves upon a basking shark 20-25’ in length! A large scar of alabaster color decorated the creature between the dorsal and caudal fins; clearly this was a survivor of a boat strike or other significant trauma. This was a fine finale of unexpected grandeur, and we left the peaceful behemoth amongst thousands of fishy cousins. Our travels far and wide yielded no humpbacks, but this strange Atlantic behavior will forever make roost in my memories! Hi! Where can I find the pictures from the 9am Tour (12-06-2016) by Rich Dolan? 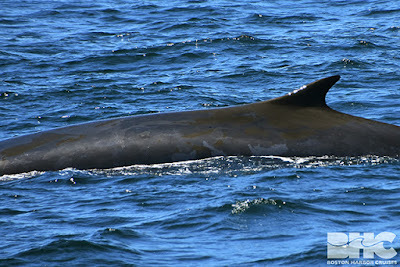 Hi, we just added pictures from the specific whale watch you inquired about. Enjoy!